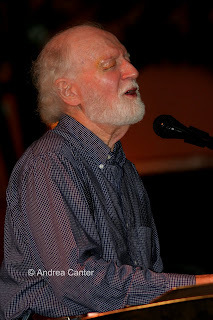 Mose Allison at the Artists Quarter (October 16). Yes, he pretty much plays tunes from the same two dozen songs, year after year. But at 81, we can overlook Mose Allison’s unchanging repertoire and just sit back and enjoy that gravely voice and still-swinging piano, listening to lyrics that are as timeless as they are clever (“Your Mind Is on Vacation,” “Fool’s Paradise,” “Certified Senior Citizen”). And if he leaves out our favorite (“Monsters of the Id”), we pout! 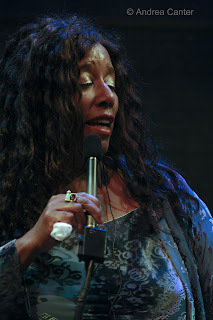 Soul Café at Hennepin Avenue United Methodist Church (October 18). 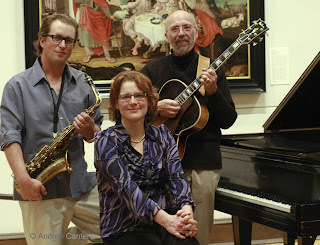 I first encountered this sublime melding of jazz and poetry about five years ago, when Soul Café (Steve Blons, Brad Holden and Laura Caviani) were monthly performers in the Art Gallery at HAUMC. The idea was to present music complemented by poetry readings, usually around a theme or a specific poet or composer. The trio has been on hiatus over the past year, occasionally reuniting for an evening as they did last weekend. The theme, appropriately enough given the weather, was “Seasons of Change,” and the poems and music took us through the year’s cycle, beginning with “There’ll Be Some Changes Made” followed by “Autumn Leaves” and an appropriately depressing poem of Billy Collins read by KBEM’s Michelle Jansen. Still the music sustained a more pleasant mood, buoyed by a guitar and sax duo. Claude Thornhill’s “Snowfall” benefited from Laura Caviani’s arrangement that takes off on a riff from “Poinciana,” while “Joy Spring” and later “Summertime” brought us full circle, ending with “Autumn in New York” (emerging after the first few notes of “New York, New York”). 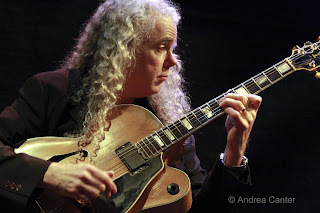 The back and forth of spoken words and jazz trio is always an engaging format where the involvement of the performers with their audience is a natural part of the evening. The instrumentation of piano, sax and guitar seems perfectly suited to the art of Soul Café.